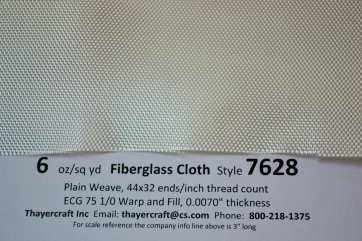 Style 7628 is a tight plain weave 6 oz/sq yd Fiberglass Cloth finished in a Silane for Epoxy Resins. 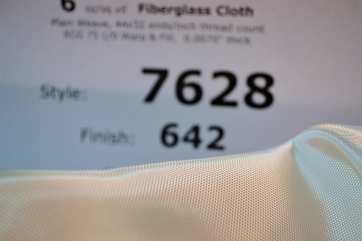 Style 7628 has a thread count of 44x32 ends/inch, uses the yarn ECG 1/0 warp and fill and a thickness of 0.007". 7628 is available in 50" width and is finished in clear silane 642 suitable for any resin though most people use epoxy. Compare this to the much looser and more conformable 6 ounce Fiberglass Cloth styles 3733 at 0.0082" and 7533 at 0.0093". 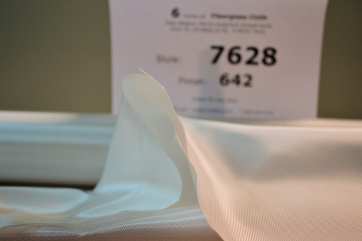 The 7628 will laminate thinner and smoother with the trade off being less conformable and harder to wet out. All rolls are rolled on 2" PVC pipe and professionally packed ready to ship. Free shipping to the lower 48.